Like the Intellivision, the ColecoVision was one of the home video game consoles I missed out on at the time it was introduced. None of my friends seemed to have on either. I guess we were all "Atari" kids at the time. Having a disposable income helps in aquiring some of the gems I missed out on as a kid. The ColecoVision is Coleco Industries' second generation home video game console which was released in August 1982. The ColecoVision offered arcade-quality graphics and gaming style, and the means to expand the system's basic hardware. Released with a catalog of twelve launch titles, with an additional ten games announced for 1982, approximately 125 titles in total were published as ROM cartridges for the system between 1982 and 1984. River West Brands currently owns the ColecoVision brand name. Coleco licensed Nintendo's Donkey Kong as the official pack-in cartridge for all ColecoVision consoles, and this version of the game was well received as a near-perfect arcade port, helping to boost the console's popularity. By Christmas of 1982, Coleco had sold more than 500,000 units, in part on the strength of its bundled game. The ColecoVision's main competitor was the arguably more advanced but less commercially successful Atari 5200. 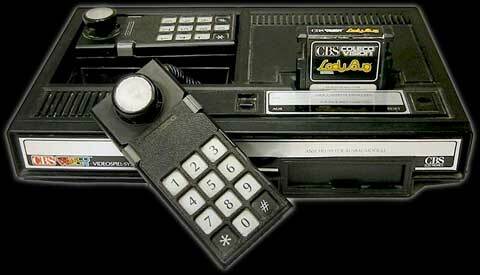 The ColecoVision was distributed by CBS Electronics outside of the United States, and was branded the CBS ColecoVision. Sales quickly passed one million in early 1983, before the video game crash of 1983. By the beginning of 1984, quarterly sales of the ColecoVision had dramatically decreased. The main console unit consists of a 14x8x2 inch rectangular plastic case that houses the motherboard, with a cartridge slot on the right side and connectors for the external power supply and RF jack at the rear. The controllers connect into plugs in a recessed area on the top of the unit. The design of the controllers is similar to that of Mattel's Intellivision-the controller is rectangular and consists of a numeric keypad and a set of side buttons. In place of the circular control disc below the keypad, the Coleco controller has a short, 1.5-inch joystick. The keypad is designed to accept a thin plastic overlay that maps the keys for a particular game. Each ColecoVision console shipped with two controllers. All first-party cartridges and most third-party software titles feature a twelve-second pause before presenting the game select screen. This delay results from an intentional loop in the console's BIOS to enable on-screen display of the ColecoVision brand. Companies like Parker Brothers, Activision, and Micro Fun bypassed this loop, which necessitated embedding portions of the BIOS outside the delay loop, further reducing storage available to actual game programming. From its introduction, Coleco had touted a hardware add-on called the Expansion Module #1 which made the ColecoVision compatible with the industry-leading Atari 2600. Functionally, this gave the ColecoVision the largest software library of any console of its day. The expansion module prompted legal action from Atari, but Atari was unable to stop sales of the module because the 2600 could be reproduced with standard parts. Coleco was also able to design and market the Gemini game system which was an exact clone of the 2600, but with combined joystick/paddle controllers. Expansion Module #2 is a driving controller expansion that consists of a steering wheel, gas pedal and the pack-in game Turbo. The driving controller is also compatible with the games Destructor and Dukes Of Hazzard. Expansion Module #3, the final hardware expansion module, was released in the summer of 1983. Module #3 converts the ColecoVision into a full-fledged computer known as the Coleco Adam, complete with keyboard and digital data pack (DDP) cassette drives. Module #3 was originally conceived to be the ColecoVision Super Game Module using game wafers as the storage medium. Although Coleco presented a mock-up of the SGM at the 1983 New York Toy Show, that product was never manufactured. There were also rumors that Expansion Module #3 was to have incorporated an RCA CED player to store larger amounts of data. Coleco prototyped a fourth expansion module intended to provide compatibility with Mattel's Intellivision, but this was never released. Two controller expansions were also available. First was the Roller Controller, a trackball packaged with a port of the arcade game Slither, a Centipede clone and meant to be used with some dedicated games like Victory or to enhance the gameplay of previously published cartridges which benefitted from its trackball system (like Wargames). The second was the Super Action Controller Set, resembling a pair of boxing gloves each with joystick and numeric keypad on top and a series of buttons along the grip. It came with the game Super Action Baseball and saw later release of the Rocky-inspired Super Action Boxing and a port of Front Line. The ColecoVision contains the same CPU and graphics chip as the MSX and Sega SG-1000/SC-3000. It also shares a sound chip with Sega consoles (including the Master System), making them identical in hardware capabilities. The MSX contains a different sound chip that is very similar in capabilities, the General Instruments AY-3-8910. For this reason it is very easy to port games between the three systems. Coleco's software approach was to license arcade games that Atari had not. Realizing that Atari had firm support from Namco (the creators of Pac-Man and many other hits), Coleco entered into contracts with companies such as Sega, Konami, and Universal. Given that the ColecoVision could produce near arcade-quality ports, industry magazines like Electronic Games were unanimous in their enthusiasm over the console. Some of the more popular games include Donkey Kong (the pack-in), Donkey Kong Junior, Carnival, Lady Bug, Mouse Trap, and Zaxxon. Coleco also popularized lesser known arcade games, such as Venture, Cosmic Avenger, and Mr. Do!. In some cases, the console versions were arguably superior to the arcade versions, as seen in Space Panic. Later Coleco continued adapting newer successful arcade games like Subroc, Time Pilot and Frenzy, the company also made inferior ports of many of these games for the Atari 2600 and Intellivision, in an effort to broaden its market. Compared to arcade ports, the ColecoVision did not offer many games original to the console, though a few notable releases are Smurf: Rescue in Gargamel's Castle, War Room, Illusions, and Fortune Builder, an early milestone in the style of SimCity. Coleco was infamous for its vaporware offerings. An example of such was to be an adaptation of Tunnels and Trolls. It is not known whether the game's printed screen shots were from an actual prototype or were merely pre-development illustrations. The ColecoVision's box itself bears several other examples, among them Chess Challenger, Side Trak, Rip Cord, Horse Racing, and Mr. Turtle. In 1996, programmer Kevin Horton released the first homebrew game for the ColecoVision, a Tetris clone entitled Kevtris. Dozens of homebrew games, as well as programming tools to aid development, have since been released. In 1997, Telegames released Personal Arcade Vol. 1, a collection of ColecoVision games for Microsoft Windows, and a 1998 follow-up, Colecovision Hits Volume One.